Mark your calendar for family fun, free food, and conversations with local fire fighters at a community Open House at Fire Station No. 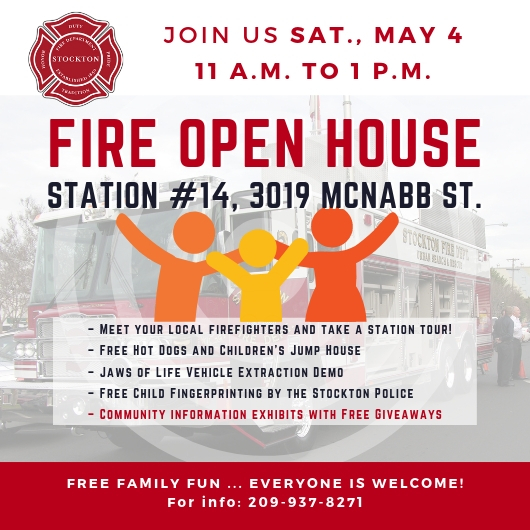 14, 3019 McNabb St.. Due to weather concerns, the Open House set for April 6, 2019, has been rescheduled to Saturday, May 4, 2019, 11 a.m. to 1 p.m. Spring is a great time for a fire safety refresher. Pick up helpful information on fire safety tips for the entire family – reminders to post emergency numbers on the fridge, test smoke alarms, and run fire drills so everyone knows where to go in case of an emergency. stop by the Stockton Police Department table for free fingerprinting for children. For questions or additional information, please contact the Stockton Fire Department Fire Prevention Division at 209-937-8271.